Freshwater mussels are an important indicator species of a healthy aquatic ecosystem. As benthic or stream bed living organisms, they play a role in the aquatic food web, in nutrient cycling and energy flow. They also help maintain water quality as filter feeders. Freshwater mussels are considered to be the most threatened taxonomic group in North America. 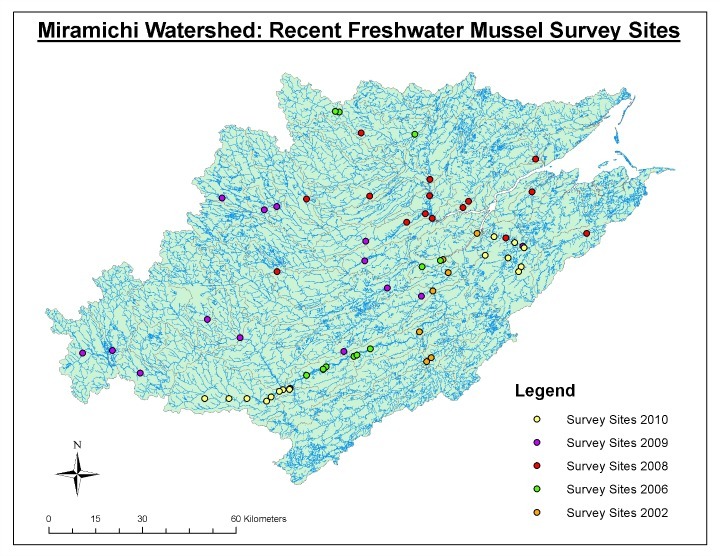 Some mussel surveys New Brunswick rivers have been completed but much remains to be completed, including work on the Miramichi River watershed. The attached maps shows the extent of work achieved by MREAC and other scientists since 2002. The Miramichi seems to be a bit of a stronghold for a mussel of "special concern" called the Brook Floater (Alasmidonta varicosa). Better determining the status of this species at risk mussel provides additional incentive to continue freshwater mussels within the Miramichi watershed. The Brook Floater has recently been assessed by the Committee on the Status of Endangered Wildlife in Canada (COSEWIC) and has a National General Status Rank of "special concern" in New Brunswick. With the discovery of this mussel in the Southwest Miramichi, further freshwater mussel surveys in the Miramichi River will help determine the range of this rare species. Brook Floaters are declining throughout their known range in the US due to pollution and alteration of river habitats (e.g. dams). MREAC has conducted five field seasons (2008, 2009, 2010, 2013, 2014) of some Freshwater Mussel Surveys for the Miramichi River watershed. We have documented 45 sites on 22 Miramichi tributaries. This project has been supported by the New Brunswick Wildlife Trust Fund. A provincial experts on mussels, Ms. Kate Bredin (consultant) and Ms. Mary Sallows (NB Museum) are acknowledged for their support in this project. Only four species of freshwater mussels have been found; Eastern Pearlshell, Eastern Elliptio, Eastern Floater and the rare Brook Floater. However, a fifth species, Eastern Lampmussel, is known to inhabit the Southwest Miramichi River as it was found by Mr. Bredin during her early work. The Eastern Pearlshell (Margaritifera margaritifera) is the most abundant freshwater mussel species in the Miramichi River watershed with 13,448 specimens counted at 39 of the 45 sites surveyed. This species has a diverse range of habitats as it was found in the rough, rocky headwaters of the South Branch of the Southwest Miramichi, to the calm, slow flow of the Barnaby River. The Miramichi River is world renowned for its Atlantic salmon fishing and also very popular for trout fishing. Both of these fish species are common hosts for the Eastern Pearlshell’s larval stage. Also, with limited industrial impacts the water quality and mussel habitat conditions on most of the Miramichi River is very good. The second most common freshwater mussel MREAC discovered during this project was the Eastern Elliptio (Elliptio complanata), discovering 683 specimens at 11 of the 45 sites surveyed. This mussel species is not as rugged as the Eastern Pearlshell and therefore was not found in the rocky, headwater sites. Most of the sites where this species was found were on the Barnaby River, which was one of the two focal rivers for study in 2010-11. A lake species, Eastern Floater (Pyganodon cataracta), was discovered at two sites. Guagus Lake was home to 57 of these mussel species, and Napan River, along a slow, sandy reach, produced one live specimen, bringing the total to 58. The Brook Floater (Alasmidonta varicosa) was discovered, or rediscovered on four of the five survey years in very small numbers. Of the Miramichi tributaries the Taxis River has been the most productive. This species continues to demonstrate its rarity and show how important field surveys are in order to understand and protect these mussels and their habitat. Miramichi River is becoming of a more important stature as habitat of this species at risk. There is one other species of freshwater mussels that can be found on the Miramichi River, the Eastern Lampmussel (Lampsilis radiata). This species was not discovered by MREAC during the three years of surveying, however, it was found during Ms. Bredin's survey efforts on the Southwest Miramichi River. With this species included, the Miramichi River watershed is home to five known freshwater mussel species. Data collected during this project was shared with the NB Museum in order to keep a record of freshwater mussel populations throughout New Brunswick. It was also shared with COSEWIC in order to be part of future status assessments for the Brook Floater, and possibility for the Eastern Pearlshell which is currently being investigated as a possible "special concern" species. This species is the most abundant in the Miramichi River watershed; conversely other watersheds have been seeing a decline in their Eastern Pearlshell population.